Monica Manzinni, working in advertising and based in North London, took part in Run to the Beat, London’s half marathon in which participants run to a soundtrack of motivational tunes along the course, in September to raise funds for IN-vision. Monica exceeded her own expectations and finished in an impressive time – in just over 2 hours – despite the gruelling hill finish into Greenwich Park. 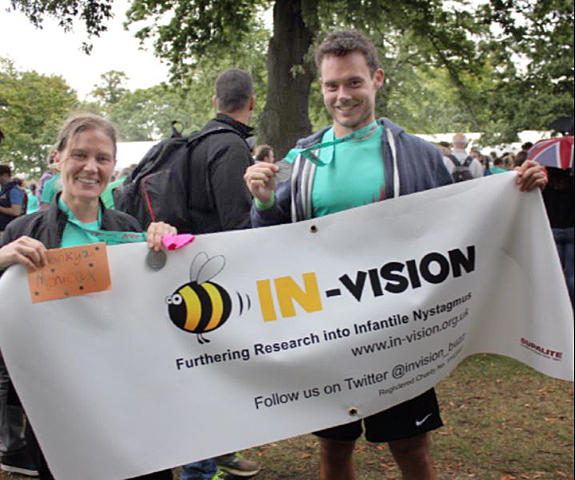 The team at IN-vision were there to cheer her on at the 11-mile marker. Monica raised over £300 for IN-vision and we now have enough funds to purchase a high quality eye-tracking system for use in southern England. “This equipment will not only enable the establishment of a dedicated paediatric eye-movement clinic in the South, but will also greatly enhance research,” said Liz Charter, Chair of IN-vision. We are extremely grateful to Monica for all the hard work she put into training and running this half marathon to support us.